Verjuice is the fermented juice of unripe grapes. It’s use as an acidulate in cooking dates back to the Middle Ages. It was a serendipitous cool season that left a crop of unripened riesling grape in Maggie Beer’s winter garden 20 years ago. The outcome was an experiment that resulted in the commercial availability of verjuice in Australia. Wikipedia tells us Beer was the first in the world to market the condiment commercially and five years ago export of Maggie Beer Verjuice began to France. Maggie Beer was at the forefront in the Australian food revolution that saw drab plain English fare replaced with the wonderful multicultural cuisine we enjoy today. Maggie needs no introduction to Australian’s as she’s considered a National Treasure not only for her fabulous food writing and range of high quality grocery lines, but also for her warm and generous persona as a TV Cook. It was ABC TVs “The Cook and the Chef” that cemented her general popularity and now she appears regularly on Australian Masterchef and is co host on the “The Great Australian Bake-Off. If you check out @Maggie_Beer on Instagram you will also know she’s a fashion leader for women of a certain age. She’s established a style I admire, a long way from the practical female farmer look of her Pheasant Farm days. More importantly though, Maggie, through her foundation is currently campaigning to improve the quality of food served to the elderly in care. Verjuice has a gentle acidity that adds a fresh, bright and complementary quality to the flavour of food. It doesn’t jar the palate like vinegar and lemon juice can, and because verjuice is made from grapes, it’s flavour profile makes it a compatible wine condiment. I have many of Maggie Beer’s cookbooks on my shelves. “Maggie’s Kitchen” from 2008 yielded this beautiful recipe that added a lively sweet vegetable dish to my “bar menu.” I adapted the recipe quantities slightly to suit my palate but aside from omission of goat cheese, the rest remains as written. These carrots were the perfect foil for the slightly salted feta cheese baked in vine leaves. Put the currants into a small bowl. Pour over the verjuice, then set aside until the currants are plump. Cook the carrots in boiling salted water until almost done, about 5 mins. Drain the carrots then rub off the skins in a clean tea towel. Set the carrots aside to cool a little. Depending on the carrots you can choose to halve them lengthwise. Drain the currants and reserve the verjuice. Toast the pine nuts in a large dry pan over a medium heat until golden. Remove the nuts from the pan and set aside. Add the butter to the pan then when melted add the carrots and increase the heat to high. Cook the carrots for 2-3 minutes in the butter then add the verjuice. Cook until reduced and syrupy and the carrots are glazed. Remove from the heat, add the salt and a good grinding of pepper, the pine nuts, currants and parsley. Toss to combine then transfer to a serving plate. This looks great and I love the balance of flavors. Verjuice is a such a great condiment and used with flair in this recipe.Must try. What a delicious idea! Another one to bookmark, thanks for sharing, Sandra. 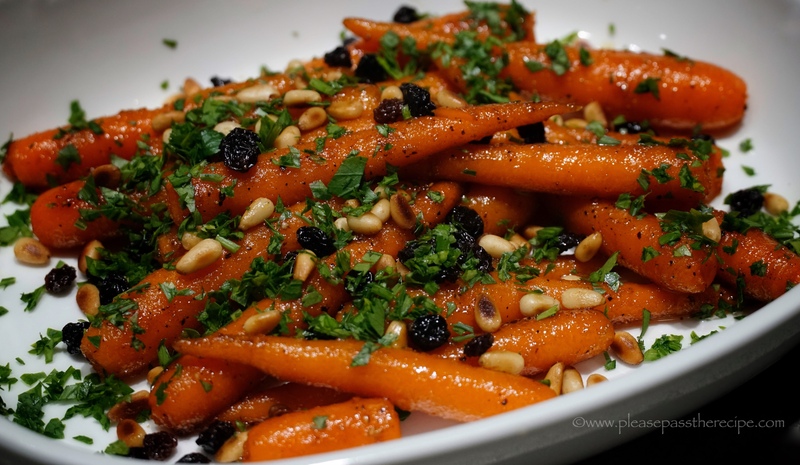 You’ll never think carrots are dull ever again Al after you’ve tried them cooked in verjuice. Fabulous!!!! Love love love this recipe. Thanks Megala, I made it again last night without the dried fruit and nuts and it was equally as delicious. Oh, great! I think verjuice is the star ingredient in here. It is nice to find you cooking carrots on the stove than inside the oven. Sandra – thank you a million times over for the recipe but, most of all, for introducing; Maggie Beer to those who may not know! How any Australian would not is totally beyond my comprehension !! Have followed her forever, buy from her wonderful store on-line every few months, remember her prior TV days with huge fondness . . . but of all the matters I have taken up in the past decade, am most proud of being a member of her Foundation from day dot !! Hah ! Verjuice ? How the hell does one cook without it 🙂 ? No idea what I’d do without verjuice in the kitchen. Yes, Maggie Beer is certainly an inspiration. Unfortunately my Dad spent his last years in Nursing Home that served food that was an absolute insult. It placed huge and unnessecary pressure on the whole family to visit daily and deliver meals. This entry was posted on January 17, 2019 by ladyredspecs in Dairy Free, FODMAP diet, Food, Gluten Free, Lactose Free, Light Savoury Dishes, recipes, side dishes, Side Dishes & Salads, Vegan, vegetables, Vegetarian and tagged accompaniments, baby carrots, bar food, carrots, FODMAP friendly, Maggie Beers, side dishes, vegan, vegetables, vegetarian, verjuice.